Workers remove soil contaminated with lead from the front yard of a Southside Chattanooga residence off of Mitchell Avenue last week. This story is featured in a TimesFreePress newscast. 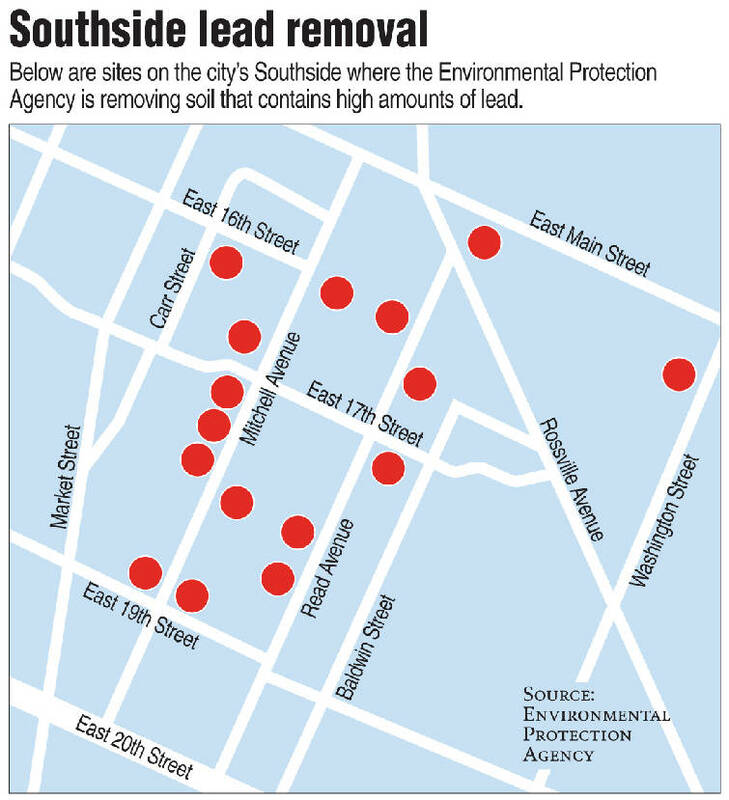 Most of the lead-tainted soil found in more than 60 yards in Chattanooga's Southside in 2011 has been removed, according to environmental officials. But high levels of the toxic heavy metal detected in seven other city neighborhoods may remain because of federal budget woes. The Environmental Protection Agency has been removing lead-tainted topsoil from the yards of 68 homes in the 1600 and 1700 blocks of Mitchell and Read avenues and along Carr Street since dangerous levels were reported in soil in October 2011. The threshold for lead removal that EPA uses is 400 parts per million; in some of the Southside yards tested, those lead numbers topped 920 parts per million. Officials say the lead-laden soil likely was used as fill dirt during construction of the homes. Perry Gaughan, on-scene coordinator for the EPA's emergency response and removal branch, said the cleanup on Mitchell Avenue is finished. Crews in white hazmat suits now are working on Read Avenue, and overall they are 60 percent finished with the Southside properties, Gaughan said. But he said high lead levels detected in other parts of the city may have to wait. Federal Superfund money is drying up -- at least for this part of the country. "Lead removal can get expensive, and EPA's budget is frozen [in this region]," Gaughan said. According to Tennessee Department of Environment and Conservation documents reviewed last week, contracted employees for Oneida Total Integrated Enterprises performed soil surveys on 93 locations in several Chattanooga neighborhoods on Aug. 14, 2012. After taking the topsoil surveys from publicly owned rights of way, cul de sacs and sidewalks, Amanda Miolen, an environmental scientist for the company, reported that she found toxic levels of lead in soil at seven locations in Highland Park, Oak Grove, East Lake, Oak Hill and the Richmond neighborhoods. Miolen's report showed an area tested in Oak Grove registered 1,566 parts per million for lead -- nearly four times the removal threshold. Another area, described as being in Oak Grove, registered at 425 parts per million. Levels between 400 and 500 parts per million were recorded in East Lake, Richmond and Oak Hill, the report states. High levels that were close but below the 400 parts per million threshold were reported in Highland Park and East Lake. The vast majority of the remaining 93 samples averaged between 50 and 100 parts per million of lead, according to Miolen's report. Miolen or other representatives from Oneida could not be reached for comment. TDEC officials said Friday that follow-up on Miolen's report "would be in the form of a removal assessment," a detailed investigation involving TDEC, the Chattanooga-Hamilton County Health Department and the EPA. Gaughan said Friday there is currently no removal assessment being conducted, and there will not be until money is available. Simply put, environmental officials are not completely certain where the contaminated topsoil came from. But a memo dated Feb. 12 from Troy Keith, Chattanooga field office manager for TDEC's division of remediation, told other TDEC employees that older residents have reported that from about 1905 to 1960, foundries in the area collected dust produced in the smelting process and "offered [it] to the community as a soil or soil amendment." On Friday, TDEC spokeswoman Meg Lockhart said in an email that the theory was "purely hypothetical and based on anecdotal and circumstantial evidence -- but it is currently the only hypothesis staff has." She also said most foundries in the Chattanooga area produced iron, which does not contain lead. Brass does, though. However, century-old insurance maps obtained by the Times Free Press do not indicate the presence of a brass foundry in the city at all. Lockhart said lead-contaminated scrap metal used in iron foundries likely accumulated in the dust. But also unclear is how widely the contaminated dust was distributed. Lockhart said lead-contaminated soil is a "regional issue confined to any city that had foundries at some point." The lead is likely in areas closest to former foundry sites because foundries wouldn't have wanted to drive the material far, she said. According to maps, Read and Mitchell avenues and Carr Street were once part of a major rail yard. After severe flooding around the turn of the 20th century, clay was moved to part of the rail yard and homes were built. Tom Rucci, director of case management services at the health department, said Friday that lead poisoning causes developmental problems in infants and toddlers and can pose some risk to adults. Children typically get lead poisoning by either eating lead-laced soil or lead-based paint. They can also be poisoned by inhaling lead dust during renovations of homes built before 1978, when lead paint was outlawed, Rucci said. "Once it's ingested by children who are under the age of 6, it will damage red blood cells, it can damage vital organs and affect the nervous system. ... It can slow a child's development and cause mental or behavioral problems," Rucci said. Parents of young children, especially infants, are urged to have blood levels periodically checked during regular medical checkups, Rucci said. "It should be done as part of regular infant checkups. Generally speaking, a child between 12 and 24 months is initially checked for lead," Rucci said. "At 36 months, if they have registered with lead previously, they should be checked again." Rucci also said parents should immediately tell doctors if their child is in a high-risk area for lead poisoning. Elevated lead blood levels can be treated, but neurological damage already caused cannot be repaired. There are some symptoms for neurological damage related to lead poisoning, such as hyperactivity, a lowered attention span and bouts of frustration in children, but Rucci said those symptoms are typical of many children at some point. And, in many cases, there are no symptoms for lead poisoning, he said. "Oftentimes [parents] would have no idea, especially if it's at a lower level, where it could be causing damage, and they would just never know," Rucci said. But lead poisoning isn't only a problem for children, said Bonnie Hinds with the Tennessee Childhood Lead Poisoning Prevention Program at University of Tennessee in Knoxville. It's also a problem for adults and animals. In adults, it can cause hypertension, reproductive issues and hearing loss, she said. Expectant mothers should be screened if they've come in contact with lead, because it can pass the placental barrier, causing prenatal damage, Hinds said. Similar problems can occur in animals, she said. "One of the things we actually know about lead is, it tastes sweet. If an animal licks it once and it's sweet, the likelihood is it will lick it again," Hinds said. For residents who plant gardens over lead contaminated soil, they should use raised beds and avoid growing root vegetables, she said. "There is always a risk, but the further the fruit [or vegetable] is away from the soil, the risk is reduced," Hinds said. Contact staff writer Louie Brogdon at lbrogdon@times freepress.com or 423-757-6481. Follow him on Twitter at @glbrogdoniv.